The American Veterans Center and Music Celebrations International have invited The Paris High School Eagle Band from Paris to be a representative of Arkansas in the 2019 National Memorial Day Parade in Washington, D.C. Cory Mikel was informed of this selection based upon an Invitation from the American Veterans Center, Music Celebrations International, and the National Memorial Day Parade Committee. This patriotic spectacle will take place on Memorial Day, Monday, May 27, 2019. The parade will take place in the heart of the United States Capitol, making its way west down Constitution Avenue, and ending at the National Mall between the White House and the Washington Monument. 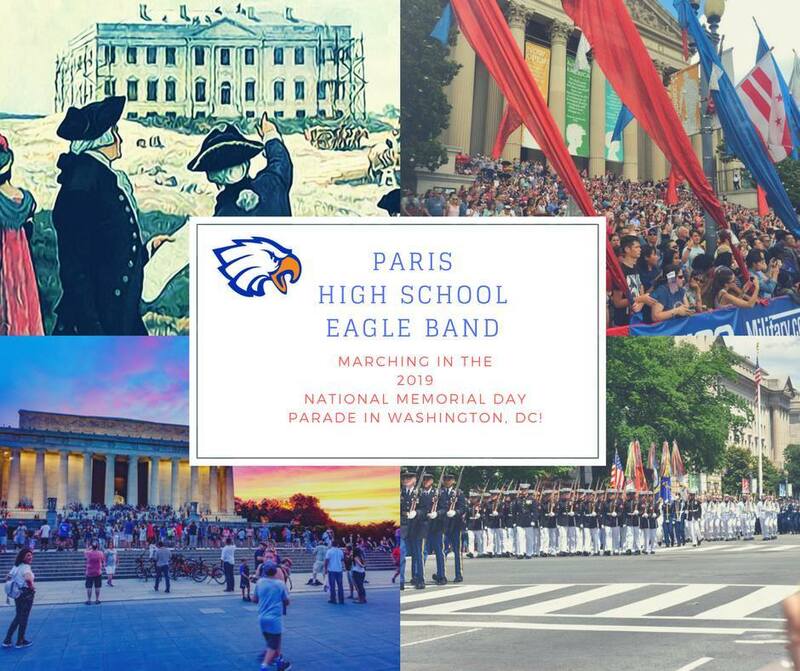 The Paris High School Eagle Band will be featured alongside bands representing all 50 states and other parade performers selected to march in this historic tribute to America’s heroes, past and present. The 2019 National Memorial Day Parade is the culmination of a weekend-long celebration, preceded by the National Memorial Day Concert Series and Choral Festival, happening at several of the area’s most well-known memorials and the John F. Kennedy Center for the Performing Arts, respectively. All three events will feature talented young instrumentalists and vocalists from around the country. For more information, visit musiccelebrations.com/parades.